Or, as the car manufacturers call it: just in time delivery. I maintain if it weren't for the last minute, nothing would ever get done, and that it doesn't really matter how long before the deadline it is accomplished, as long as it's before. So, as my children pile into their cars to head north to soggy Green Bay, I decided we needed little Christmas Stockings for the lot of them. 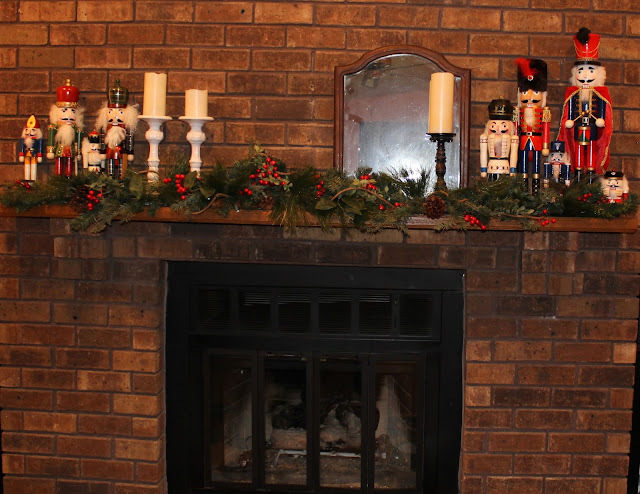 Stockings have been a fun part of our holiday tradition. I loved finding silly little things to include. Every year the kids each got a flash light, that was standard, and an orange in the toe. (Kids these days have no idea how precious an orange in December once was, but they're getting one any way.) One year I found little guns that shot discs, they were so cool! I'll never forget seeing the air filled with colorful little circles, and how the kids just howled with glee over them. The discs were all lost within days, I half expected to find one when we moved out. We always hung the stockings on the kids' bedposts. It was our scathingly brilliant method of keeping the kids from pestering us before 5 am. (Works with Easter baskets, too.) It was so sweet to wake up to whispering, giggling boys who thought they were pulling something over on us. These are little stockings, just big enough to hold a clementine in the toe, and we'll include a small can of silly string and other silly things, and some candy of course. They are ridiculously easy to make, and would be a fun way to give a little something to the nice folks in your life. The stocking is just eight inches tall and about four inches wide at the top. I used flannel, which I washed in hot water and dried on hot to shrink for fluffy goodness. 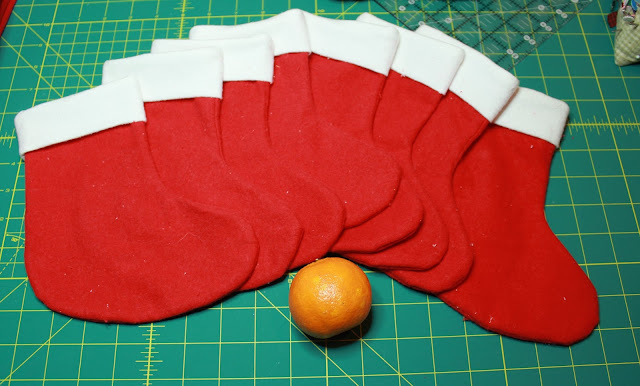 I used a 1/4" seam allowance to sew the stocking shapes right sides together. 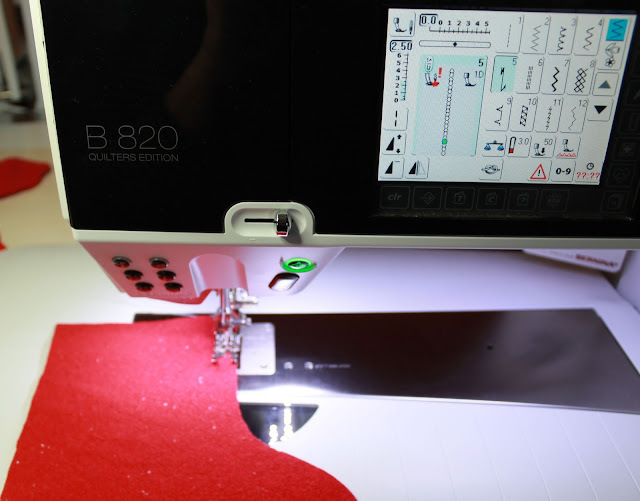 The dual feed function made it easy to sew the bulky fabric without shifting. A walking foot would be great for this. To make your own stocking with these instructions, cut the cuff so that it is 1/2" less wide than the raw measurement of the top of the stocking, and twice as tall as desired plus 1/2". The short end of the white flannel rectangles are sewn together. I pressed the cuff seams open, and since the iron was hot, I pressed the first and last couple inches of the stocking seams too. 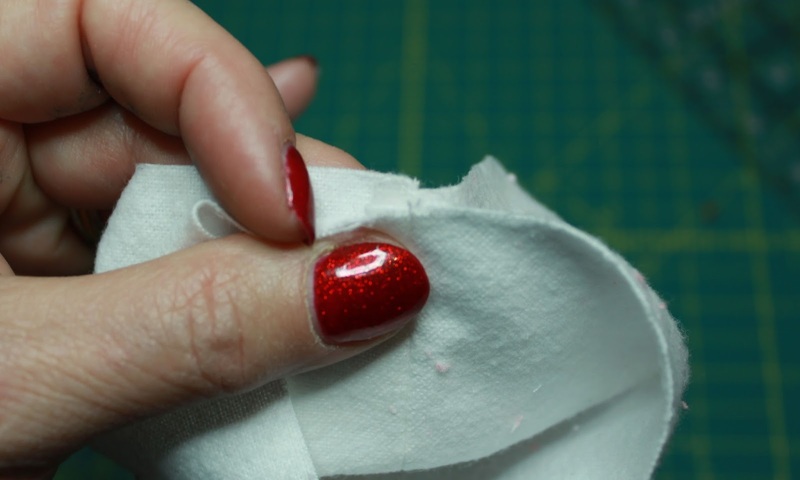 It will make it easier to sew the cuff in place, and clipped the seam allowance at the curve. The stocking isn't turned yet. *For those who have more than a last minute, you may want to embroider the recipient's name on the cuff, you'd want to do that before sewing it. I'm just going to write their names on with a fabric ink pen. Now, here's where it gets a little crazy, but it's super easy. The cuff is folded in half, wrong sides together, matching raw edges and the seam. Slip the cuff over the stocking. 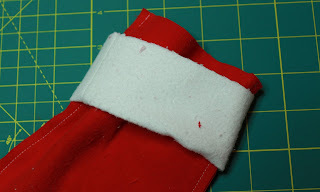 Match the cuff seam to the back seam of the stocking. It looks like the stocking is a little bigger than the cuff, but it's not. 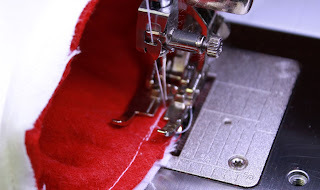 A couple of pins, one at the seam and one opposite will help keep everything in place. Make sure all three layers of fabric are aligned. Here's the magic. This is a tiny opening, it's even too small it fit over the machine's free arm. So, we're going to sew it from the inside. 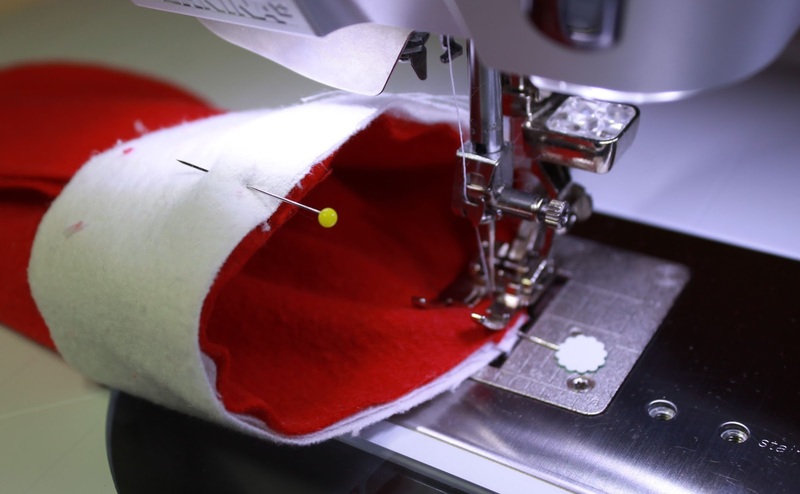 Let the bulk of the stocking sit above the foot and just rotate the seam into the foot. (The first time I saw this done my poor little head almost burst. Of course it's easier! This is why we take classes.) I don't back stitch to start. But I do finish with back stitching over the beginning of the seam. 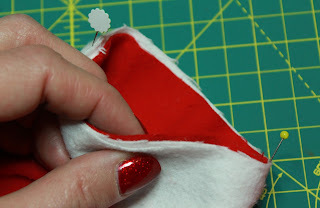 Turn the stocking right sides out and then gently fold the cuff down over the top. 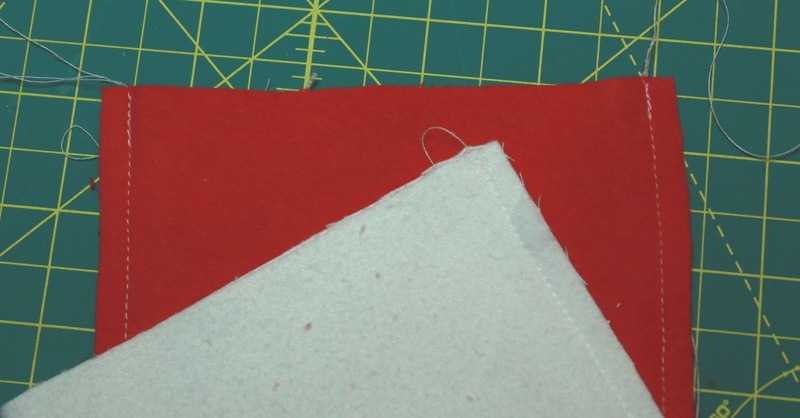 The cuff seam is hidden in the fold. I'll be sewing on little yarn loops for hanging, but they could have been included in the cuff seam. Who doesn't want an excuse to do a little sewing right before Christmas? 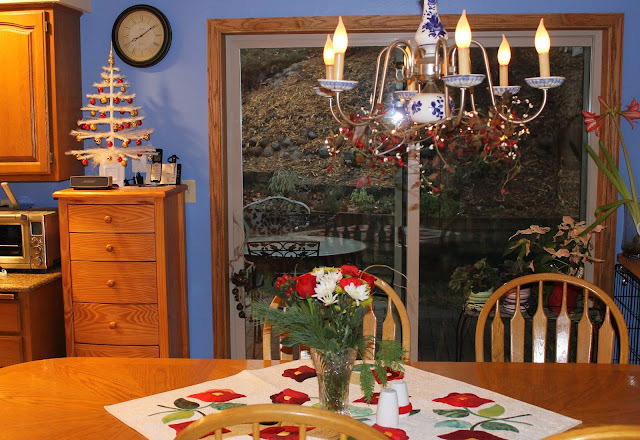 Next I think I might whip up a couple of valances for the guest bedroom. Just kidding. Maybe. It's going to be a full house for us this year, something I never imagined when thinking of our first Christmas in Green Bay. "Home" has been Saginaw for us for so long, I figured that's where the guys (and their girls, who all still have family there) would head for the holidays. It turns out that home is where I am (and Kent of course, too), even if they've never been here before. 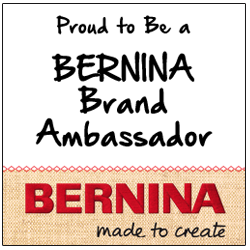 I can't tell you how much this surprises me and fills my heart with joy. Silly girl that I am, I thought that I might actually get my Christmas Yet To Come quilted in time for this year, but progress has been slow. I'm struggling with the design for the quilting. The trend towards hyper-quilting continues and I've seen some so extraordinarily quilted that I am left breathless. 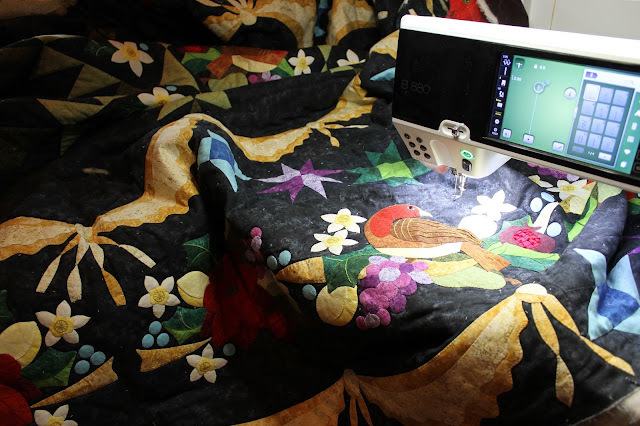 The truth is this style of quilting takes a lot of planning and marking, two things that I really don't enjoy (understatement here, loathe might be more accurate) when it comes to the quilting part. I'm more of a "quilt what comes first and figure it out as I go" kind of girl. 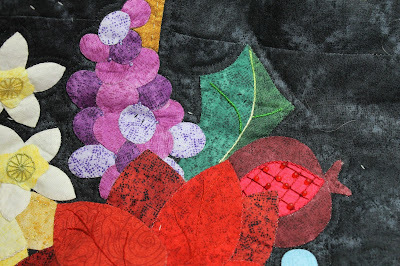 So for now, I'm just finishing the ditch stitching and adding a quarter inch echo around the applique. Once the holiday has been savored I think my brain will clear and I'll be able to make a plan, or not plan, and move forward. This has been a year of changes for us and changes can be very hard, even good ones. We love pretty much everything about Green Bay, but it still doesn't feel like home. There are days when I just want to put everything back where it belongs, where it sat for so long before. Having the boys want to come here, just because we're here (well, there was also a promise of a tour of Lambeau Field but that came after the plans were made), both confounds and comforts me. My wish for you, this holiday season, it that you'll find peace with where life puts you today, and revel in the joy and power of hope for tomorrow.